For Games for Windows - LIVE on Windows 8 or later, install the latest Games for Windows - LIVE software. No longer being updated as of July 2012. The game was removed from Steam store and the Steam version is no longer supported, see Launching the game through Steam. Run 7-Zip or similar as an administrator. Can be changed in game using zoom commands. 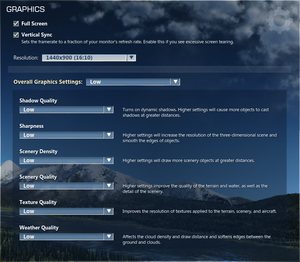 Integrated into general graphics settings. Enabled by default. Set in Options, Graphics. Remapping keys for the Xbox 360 Controller. Supports DirectInput and XInput controllers. 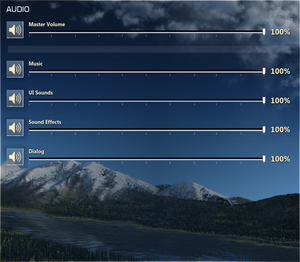 Music, UI Sounds, Sound Effects and Dialog. Enabled by default. Set in Options, Gameplay. 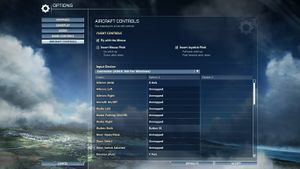 Always mutes; game pause can be configured in Options, Gameplay. This game supports Universal Plug and Play (UPnP) for automatic port configuration. The Steam version is no longer supported. You can either install the Games for Windows Marketplace version in order to play, or use a Steam URL to play. 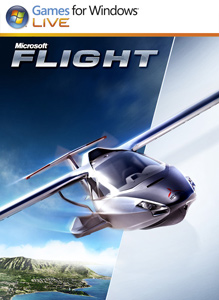 Install the Games for Windows Marketplace version of Microsoft Flight. Use the same Microsoft account in-game to continue with your existing saves, achievements and DLC. This version of the game will now work; the Steam version can be deleted. When you first launch the game, you will need to input a CD-key obtained from Games for Windows Marketplace, so launching the game through Steam may be possible only for existing players. There may be issues with activating CD-keys for DLCs bought previously from Steam Store. Contacting Microsoft Flight support directly by sending a mail to microsoftflight@microsoft.com describing the problem might help solving some of the issues. Games for Windows - LIVE filed to reinitialize. Another Games for Windows-LIVE title may be running, or your product installation may be corrupted. There is a simple way to fix it: You should uninstall Games for Windows - LIVE through Uninstall or change a program application, then download an install it again. Locate all tmp*.cat files and delete them. If no files are found advance to the next step. Locate all kb*.cat files and delete them all. If no files are found advance to the next step. Locate all oem*. * files and delete them all. If no files are found advance to the next step. Locate the cmd.exe file, right-click the file, and then select Run as administrator. Exit the command prompt and launch the game. The game may launch with a black window on-top of game window, obscuring the view and making the game impossible to play. The issue happened on Windows 8.1 64-bit with two monitors (1920x1080 and 1280x1024). Right click Windows desktop and choose the Screen Resolution menu. The second monitor will go black, and won't be usable for the duration of game, however. The issue may come back with subsequent alt-tabbings. ↑ Games for Windows - LIVE DRM features: SSA activation, requires a Microsoft account - local profiles are not supported. ↑ 2.0 2.1 File/folder structure within this directory reflects the path(s) listed for Windows and/or Steam game data (use Wine regedit to access Windows registry paths). Games with Steam Cloud support may store data in ~/.steam/steam/userdata/<user-id>/203850/ in addition to or instead of this directory. The app ID (203850) may differ in some cases. Treat backslashes as forward slashes. See the glossary page for details. This page was last edited on 1 April 2019, at 04:52.